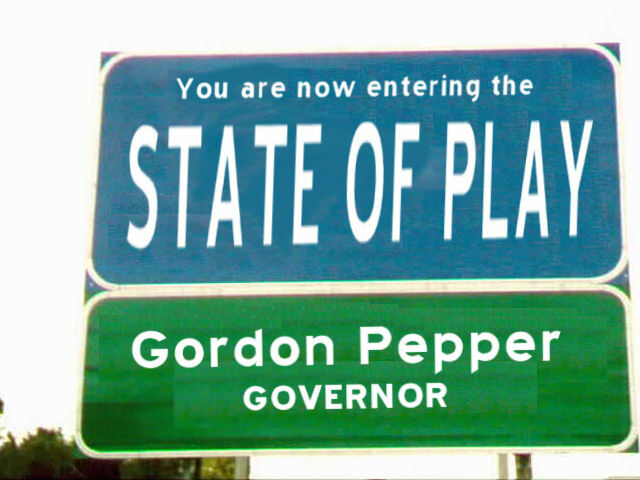 Gordon: Welcome to this week's State of Play. This week, we have another point/counterpoint, this time in the discussion style, as we share our opinions on Ken Jennings and the events of his week. Joining me today are Jason Block and Jason Hernandez. Good morning, guys. Gordon: As we all know, Ken Jennings had a satirical column up, roasting Jeopardy and Alex Trebek. The New York Post found it and blasted Jennings for the column. Jennings has turned around and blasted the Post back. The first question of the day, and a simple one at that - who should be blamed for this mess? Jason: Honestly, I think the media are to blame on this one. All they had to do was call Ken and say, "Do you really mean this?" One question could have saved a firestorm. Michael Starr did not do his job. They went with the story before checking with him. I feel sorry for Ken. Gordon: I do believe that the reporter did not do his homework and should have done some more research. HOWEVER, you have to be responsible for what you write, and I think that 1. Ken Jennings's work may have been a bit too dry and 2. you should never, NEVER bite the hand that feeds you, even in a joking sense. Gordon: The difference is that your sarcasm and jokes are very clear. Ken Jennings has a VERY dry wit and with him, it's hard to tell when he is joking. Jason: I will admit, that in my dealings with Millionaire, that I have never said anything bad about Regis, the show, Michael Davies et al. JD: I sense a but coming. Jason: B. But Ken is different. JD: and there's the but! Jason: He does have an ego. He thought he could get away with being sarcastic. That being said, the Media didn't do it's job. I think it's the media's job to check out what's being written. I think one question could have saved Ken a heck of a lot of trouble. Gordon: I think that as a celebrity, Jennings is going to be put in the spotlight a little more than anyone else. I also think that as a celebrity, you have to be VERY careful with what you say and do. Jason: That happens with all celebrities though. Most don't care now these days. There is a feeding frenzy with celebrity with all the news shows. JD: Yea, and we are all celebrities in the game show world, so we should be careful with what we say or do. Gordon: I think this will teach Ken a lesson as to be very careful with what he writes. He should never have touched that subject, even in parody, to begin with. JD: Because, believe it or not, somebody is watching over your shoulder. Gordon: For example, should I even jokingly write that Jason Hernandez and Jason Block have worms, some crackpot is going to take is as news. Someone may even read this and believe that both of you have worms. Jason: And especially with ALL the people wanting to tear Ken a new one, he did open himself to this. But Ken really doesn't care. His page views went to nearly 600,000 in one day. has a new book coming out? I might check that out...."
Gordon: Now let's go to that next question - Did he write that to get people to come over to look at his book? JD: Hell yes he did! JD: If I had a book coming out, I'd do the same thing. Jason: So you think this is a carefully planned stunt by Ken. JD: I think it is. Gordon: I'm not sure if I advertise for a book by painting my employers and friends in a negative light. Jason: No, but some one once said, "I don't care what you say about me. Just make sure you spell my name right." I think Ken is getting publicity for his book. Is it going to change any opinions about him. Probably not. JD: Yea, it sure didn't work for Jose Canseco. :-p Oh gosh... he has such a positive light around him.... NOBODY will buy HIS book! Gordon: Even if it's satirical and even if he makes a few million, at what cost to the people around you? Jason: Do you really think Ken cares? Gordon: If I was going to have a publicity stunt for the book, it wouldn't be at the expense of my friends. Maybe the Ken Jennings tour didn't work out and the Ken Jennings game show hasn't gotten off the ground yet, so maybe he was feeling desperate, but to quote Chico Alexander, you don't want to start creating bad joojoo. JD: Honestly, I don't see it as such. I see it as the media blowing things more out of proportion than that lady with a 13-inch waist on I've Got a Secret. Gordon: The media isn't bad, and I can't completely blame the media. Gordon: Let's get to the next question. Was it really a complete satire, or was there some actual fire behind what Ken was writing? JD: I've never been on Jeopardy, so I don't know if I can answer this. Jason: There is a quote, "The Truth is said in Jest". I think there is some fire behind it. Even if he meant it as satire. Gordon: I think there was something behind it too. As much as he says that his writing is satirical, I think that something had to be going on behind the scenes that we didn't know about. JD: Maybe Ken saw Alex changing batteries? Jason: He thinks he is going to be bigger than the show...he isn't. Someone will, someday beat his record. And all he will be is a historical footnote. Gordon: I think Ken Jennings will always go down as a footnote and will always be of some importance, but now here's the part where his lack of charisma hurts him. Gordon: He's known as someone who can play the game, but he's not likable, not in a Richard Hatch or a Jason Block sort of way. Jason: Hatch isn't that likable now. Gordon: True, but he was then, and he got himself a ton of offers, including a radio job. If Hatch's personal life didn't come out of the closet (pardon the pun), he would be a very well endorsed person today. Jennings just doesn't have that sort of personality that people want to know more about. Jason: As of right now? Gordon: As of any point. JD: Mister Block, have you thought about writing a book yet? Jason: No not yet. Ken Jennings' book is # 7,614 in books on Amazon. Jason: No it isn't. But again it's 6 weeks away. JD: So what, it'll be somewhere along #5,000? Gordon: That's true, too. But with this publicity, there should have been a jump. JD: Come on... It will not make much of a jump. His book will probably be around #4538. Right there with origami and the advanced Kama Sutra. Gordon: I will agree with Jason H. I don't think the book makes much of an impact in the market. Jason: Neither do I. I will buy both for completist's sake. Gordon: And I think that if he wanted to get publicity, the TV show is the way to go, though if you think about it, we see just how damaging Brad Rutter's beat down over Ken Jennings really was. Jason: Brad Rutter has shown how to handle this fame and fortune if you ask me. He continues to host a quiz show in PA on public access and has done nothing to damage his credibility. He doesn't to have to call himself "The greatest Jeopardy champion of all time" on his book jacket like Ken did. Gordon: So he hasn't gone looking around to try to capitalize on his fame and fortune. Jason: Or he hasn't really needed to. Gordon: If you're content with where you are, then why not? Any other questions or comments? JD: I'll be coming out with a new book: My Fear of Red Balls....and how you can stop it from affecting you! Gordon: What would your book be titled, Mr. Block? Jason: If I wrote one..."To Be The Hammer and Never The Nail". Gordon: What should my book be titled? Gordon: On that note, this ends this week's State of Play. A very special thanks for the two Jason's for hanging out. Gordon: This is Gordon Pepper, saying Game Over and spread the love - but watch what you write and report. Write the Jason/Gordon/Jason sandwich at gordon@gameshownewsnet.com.